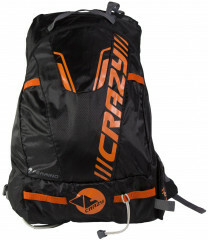 Pronounced “energy”, the NRG pack from Crazy Idea is anything but crazy. Non-garish colors, a full checklist of features, and an affordable price make the pack very sensible for skimo racing or light & fast ski mountaineering. Ski carry system that can be used without taking the pack off your back. Durable ripstop nylon feels like it will last longer than some others. Side crampon pocket for quick access to crampons or an extra layer. Mesh shoulder straps and back keep the air flowing while you’re running hot. Should strap unbuckles so you can slide on a water bottle holder. Storage area and loop for partner tow, though no line is included. Dual ice axe holders are great for technical approaches. Internal supports and shoulder feed for hydration sleeves. Built in whistle so you're race legal in Europe. Note the ski carry system holds skis with tails up to about 130mm, but could be lengthed by changing the elastic cord. The adjustable wrap-around shoulder strap is very long to accommodate wide tips and the attachment clip is easy to operate. Hi. Im looking for a pack that i can carry as a day pack in a hut trip. I usually use a 70 liter to get to the hut but I'm looking for a lightweight pack that is still a legit ski pack but is lightweight, preferably can be rolled up or made really small to strap to the outside of my main pack but still has enough capacity to carry all the essentials for ski mountaineering. Will this pack fit the bill? Any other recommendations? Hi Allan, yes you could use a race pack for that purpose. The Osprey might roll up a bit better but the Crazy Idea would be a bit more rugged for usage. Which osprey pack where you referring to? Hey Allan, the Kode race.